India’s exports climbed 13 per cent to $26 billion in August and its trade deficit decreased to just under $11 billion, data from the Indian Ministry of Commerce and Industry revealed on Tuesday. The country’s trade deficit in August was at its lowest level since the $10.3 billion posting in March as gold imports declined from $2.2 billion in July to $650 million in August, Commerce and Industry Minister Anand Sharma said at a press conference. “The fall in gold imports is not an aberration. It is going down consistently and I expect the trend to continue,” he added. The government will review sectors that are not performing well, according to the minister. “We will take a considered view and make intervention to support those sectors, which are lagging behind, and that we shall do it after the review in October,” he said. The country’s top economic advisor Chakravarthi Rangarajan said on Tuesday that India’s economy is likely to grow at 5.5 per cent this fiscal year. 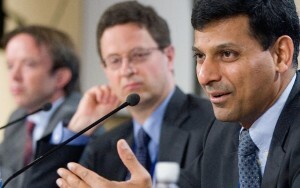 “I do expect the growth rate of Indian economy picking up in the current year. I expect the growth rate to be around five to 5.5 five per cent,” Rangarajan said. “In the last 2-3 weeks, there has been hurried activity in Parliament and quite a number of legislations have been passed, including some very important ones that were stagnated have now been passed,” he added. India’s Parliament recently approved a new land acquisition bill that aims to ensure industrialists pay fair compensation to farmers. It also approved a long-pending reforms bill to allow foreign investments in pensions. In an economic survey earlier this year, the government had projected the country’s economic growth to be around 6.1 to 6.7 per cent in the 2013-14 fiscal year. However, during the April-June quarter, GDP growth fell to a four-year low of 4.4 per cent, compared to 5.4 per cent in the same period last year. The new Reserve Bank of India (RBI) Governor Raghuram Rajan recently announced measures that would enable existing banks to open new domestic branches without RBI permission. New banking licenses will also be issued by January. The central bank will also issue inflation-indexed savings certificates and take steps to encourage financial services for the poor, including making payments easier through mobile banking, said the governor. Rajan pledged to improve the system for banks to recover bad loans by accelerating the work of debt recovery tribunals and asset reconstruction companies.